Saddle Up Stables trails are the best in the area. 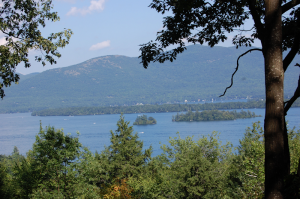 Beautiful trails wind through the ancient forest that lead to the top of the mountain where you see a lovely view overlooking Lake George. 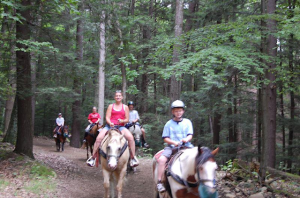 The view of the lake and the mountains of NY and Vermont in the distance is absolutely breathtaking from horseback. Along the way, see old landmarks and perhaps see some wildlife. 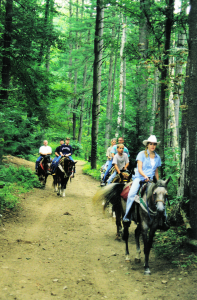 Enjoy a peaceful trail ride under majestic hemlocks and pines where it can be quite cool in the forest, so you don’t need sunglasses and may need a light jacket on cooler days. We regularly keep our trails maintained, so you will not find narrow paths here. 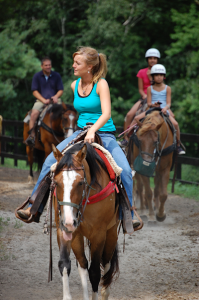 Horses are chosen to match the rider to the horse according to your ability and size. 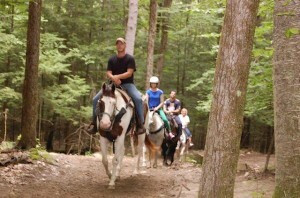 The trail ride takes approximately an hour. Rides leave about every 10 to 15 minutes and you don’t need reservations. However, if you have a large group, please call us in advance. 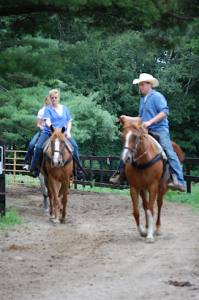 We have plenty of horses, so you normally don’t have to wait long. 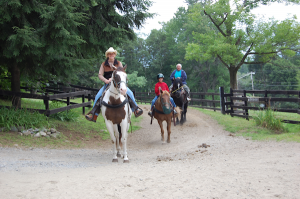 We have experienced trail guides to accompany you on the ride. Ride coming back from the trail. The view from top of the mountain.